In Pregnancy, What's Worse? Cigarettes Or The Nicotine Patch? : Shots - Health News Everybody knows that you're not supposed to smoke while you're pregnant because it's bad for the baby. But nicotine patches often used to help women quit may pose a risk, too, researchers say. Other forms of nicotine replacement may do less harm. Stern, who lives in Massachusetts, was 21 at the time and had been smoking since she was 14. So she spoke with an attending physician at the hospital about quitting. "I said, 'I want to, but I'm afraid I'll mess up and I won't be able to do it,' " Stern says. "He suggested that I use the patch and prescribed it for me." No one knows exactly how many women use nicotine replacement therapy during pregnancy. But the number is probably large. Each year, more than 500,000 babies in the U.S. are born to women who smoked while they were pregnant. And surveys show that up to 30 percent of doctors offer nicotine replacement to pregnant women who smoke. I smoked heavily for the first seven weeks of my pregnancy because I didn't know I was pregnant. Yet researchers have widely differing views on whether pregnant smokers should consider nicotine replacement. Some think it's a good way to reduce a fetus's exposure to many of the toxic chemicals other than nicotine found in cigarette smoke. Others point to studies suggesting that nicotine replacement doesn't help pregnant women quit smoking, and that nicotine itself can endanger a fetus. "Let's first start with, does it work?" says Ted Slotkin, a professor of pharmacology at Duke University School of Medicine. "The answer is not very well or not at all." For a typical smoker, nicotine patches, gum, lozenges or inhalers can double the likelihood that an effort to quit will succeed. But studies haven't shown that kind of success in pregnant women. Just last year, the New England Journal of Medicine published a study of 1,000 pregnant smokers in the United Kingdom. All of them got counseling and were asked to wear an adhesive patch on their skin. Some women got nicotine in the patch and some women got placebo. There was no difference in the women's quit rate. I used the nicotine patch for about two months, and then I was done completely and I had quit smoking. It did work. By the time the women gave birth, the ones who got nicotine replacement were just as likely as those who didn't to have resumed smoking, the study found. But the women who got nicotine patches had been less likely to smoke early in their pregnancies. That sort of result suggests nicotine replacement may help a mom even if she doesn't quit, Slotkin says. "It's much better that she takes nicotine instead of all the other smoke products, because they're going to cause lung cancer and other things." But it's not clear whether her baby is better off. 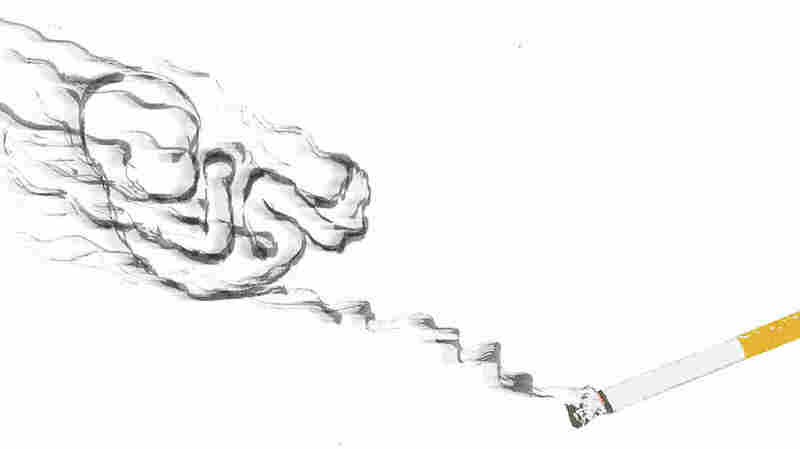 There are thousands of chemicals in cigarette smoke, and it would be almost impossible to figure out how each one affects a fetus. The real question, Slotkin says, is how many of the health problems seen in the offspring of smokers are due to nicotine? "And the answer is, an awful lot." Animal studies show that nicotine is especially disruptive to a developing brain. This may be why women who smoke are more likely to have children with problems including ADHD and conduct or learning disorders. Brain development is a delicate process controlled by chemical signals that act a bit like a piano score. Ordinarily, the signals make sure that individual brain cells play the right note at the right time. But nicotine interferes with these chemical signals. "It would be the equivalent of trying to play this piano piece and some clown comes along with a chunk of two-by-four and slams a bunch of keys down and holds them down," Slotkin says. A developing brain can repair the damage when signals are interrupted temporarily, Slotkin thinks. So pregnant smokers who use nicotine replacement might be better off avoiding the patch, which provides a continuous dose of nicotine through the skin. In contrast, gum or lozenges or inhalers allow nicotine levels to fall between doses. But the best option for a pregnant smoker, Slotkin says, is no nicotine at all. Going cold turkey is daunting for a lot of smokers, though, including Megan Stern, the Massachusetts mom. "I used the nicotine patch for about two months, and then I was done completely and I had quit smoking," she says. "It did work." I just know that nicotine is a negative thing to experience, and [my son] experienced it up until he was a 4-month-old fetus. That's a pretty long time. A number of researchers believe nicotine replacement therapy can help some pregnant women smoke less even if they can't quit. They also say it's hard to draw conclusions from some of the big studies of nicotine replacement in pregnant women. For example, the study of pregnant smokers in the U.K. is hard to interpret because only 7 percent of the women who got nicotine patches actually used them correctly, says Dr. Cheryl Oncken, a researcher at the University of Connecticut Health Center. The rest simply stopped using the patches after a few weeks. In her own research, Oncken has found that nicotine gum does help. "It helped women reduce their smoking but not actually quit," she says. The study also showed that women who used nicotine gum had lower overall exposure to nicotine and had babies who weighed more. And nicotine isn't the only toxin in cigarette smoke that can affect brain development, Oncken says. There's also a lot of carbon monoxide, which has been shown to damage fetal brain cells. "And there are other things that could be neurotoxic," she says, "such as lead, there's arsenic, there's a lot of bad things in cigarettes." He's a great little kid. He's really smart and he's fascinated by all kinds of scientific stuff. He loves to go on nature walks and collect samples. He has a microscope. Unfortunately, science has yet to provide the solid answers that pregnant smokers need to assess nicotine replacement therapy. "There's no clear path to follow," she says. "So the decision has to be between the patient and her health care provider." That's how Megan Stern ended up using a patch while she was pregnant. Her son is now 5 and has some problems with behavior and attention, she says. "There could be a lot of reasons for that," she says. "I just know that nicotine is a negative thing to experience, and he experienced it up until he was a 4-month-old fetus. That's a pretty long time." But Stern says she doesn't dwell on how smoking or nicotine might have affected her son. "He's a great little kid," she says. "He's really smart and he's fascinated by all kinds of scientific stuff. He loves to go on nature walks and collect samples. He has a microscope."